Add Home's Harmony to your favourites! 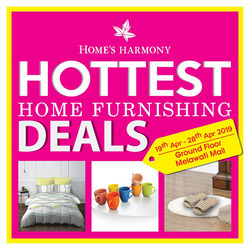 Don’t miss out our Hottest Home Furnishing Deals at Melawati Mall, Ground Floor, starting from 19th- 28th of April. 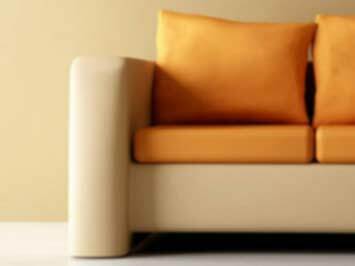 Home's Harmony is a convenient one stop bed and bath supply chain centre offering household-furnishings, home linen and bedding accessories. The range of products are designed by some of the finest international designers of high quality, the latest designs, with added value and service excellence. Home Harmony's products include Bedding, Pillows and Bolsters, Bath Towels and Shower Curtains, Carpets and Mats, Cushions and Cushion Covers, Living Room Coffee Stools and Charis, and Decor and Wall Art. Follow Home's Harmony on Facebook for all the latest product updates, events and promotions. Browse through the wide selection of Home's Harmony products online at their website. Home's Harmony markets their own products as well as externally sourced bed and bath linen products from brands such as Jean Perry, Louis Casa, CotonSoft and more. Home's Harmony commenced operations in the mid 1990s. Today, there are 16 fully owned Home's Harmony outlets in Malaysia. For more inspiration, view real home settings at one of Home's Harmony showrooms near you. Do you want to receive more offers from Home's Harmony by email?